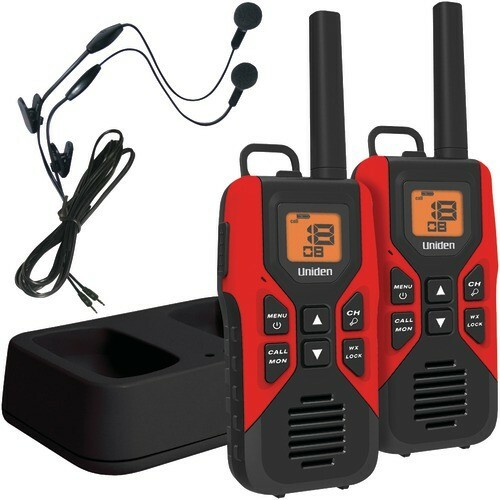 With a 30-mile range and an array of features, the UNIDEN GMR3055-2CKHS 2-way GMRS/FRS radio makes an unbeatable addition to your outdoor gear or your emergency supplies. Hunting? Adventuring? Extreme sports? Apocalypse preparedness? Fishing? Vacationing? Whatever the activity, this two pack of compact rugged two-ways make a solid choice. Better yet, with this pack, you also get compatible headsets for more convenience and versatility. There’s seven FRS channels well suited to short and medium range communication. For those times when you’re really pushing the radio’s limits, as long as you have the appropriate license, you can choose one of the 15 available GMRS channels. To further increase your privacy and uninterrupted communication, you’ve got access to 121 privacy codes. In total, that gives you an impressive 2,662 possible combinations, ensuring you can always find an available channel and communicate with your team in private, without the interruption of transmissions from other parties. 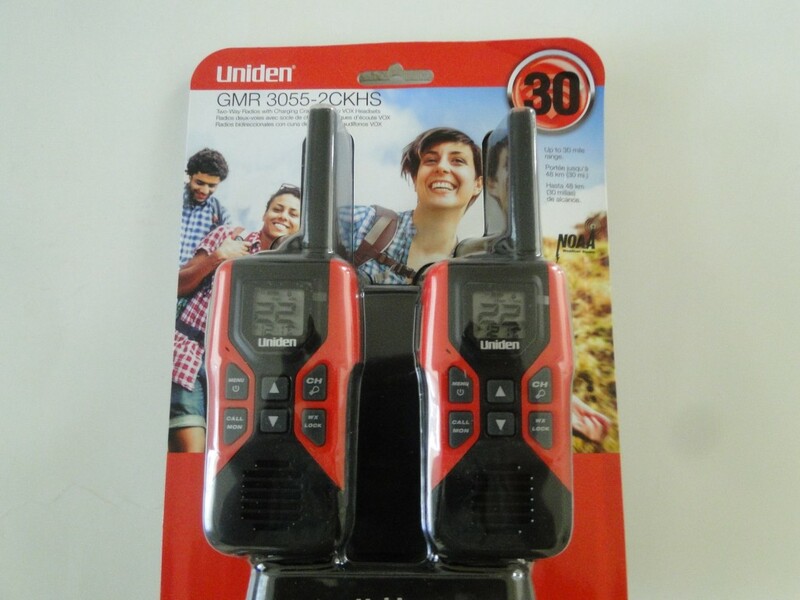 Because the GMR3055-2CKHS from Uniden operates using industry-standard frequencies, as long as you’re on the same channel and privacy code, you can talk to anyone using any other FRS/GMRS radio, regardless of model or brand. You can expect a maximum hill to valley range of 30 miles. This is based on a clear line of sight, with minima interference and few obstacles. Obviously, the more interference and the more built up a location is, the lower the maximum communication distance. But wherever you are, this Uniden 2-way gives you ample effective communication range. Thanks to the VOX function, for those times when your hands are occupied, you can go hands-free at the touch of a button. Even if you’re not wearing a headset, you can make use of the hands-free system. Just start talking and the VOX starts transmitting. Simple as that. Then you can stay in contact with your team without pausing your current activity. It’s a particularly useful safety feature if, for example, you’re climbing or hiking and need to communicate while using your hands for balance. But don’t let her catch you unawares. Make use of the weather alert feature. You can simply tune this two-way from Uniden into any of the seven NOAA weather channels and listen in or set up alerts. Then, when Mother Nature is feeling temperamental, you’ll receive an alert so you’re always prepared for the unexpected. Uniden recognises that sometimes you need to communicate quietly or privately. 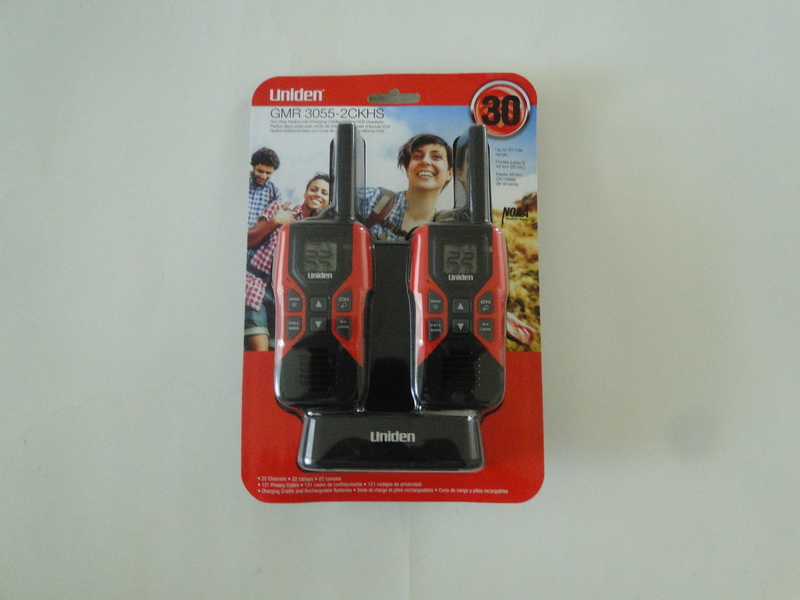 That’s why the GMR3055-2CKHS two-way radio two-pack comes with two earbud and mic headsets. Simply plug the headset into the jack and insert the earbuds in your ears, and you’re ready. The mic is conveniently located on the headset cable, so it’s easy to talk and listen without being unintentionally overheard. Silent Mode is another useful privacy feature. Activate it, and all tones go silent. You’ll still hear transmissions and calls, so you won’t miss any important messages from your group. 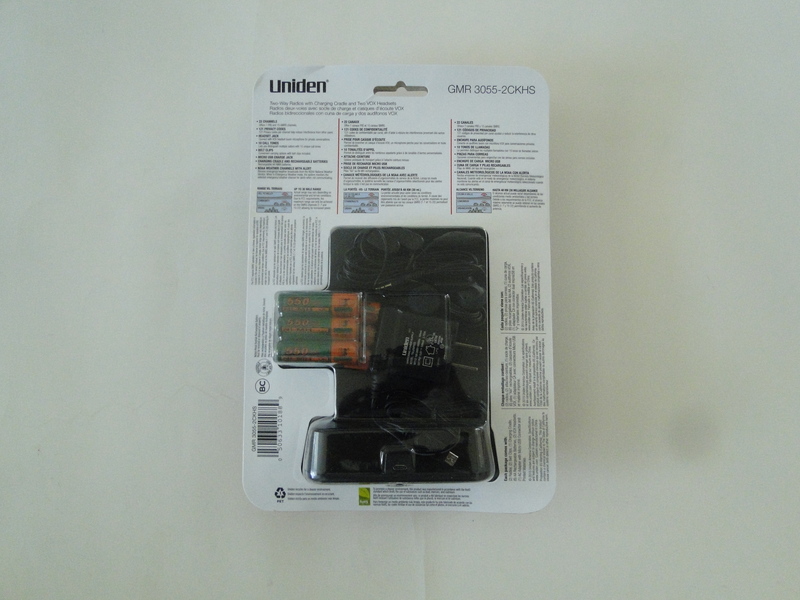 You have a couple of options when it comes to charging the Uniden GMR3055-2CKHS. You can use the dual-docking charging port to charge one or both radios in the pack simultaneously. Alternatively, you can charge one radio at a time using the included micro USB cable to charge from any USB power source, from your laptop to your smartphone charger, or even a USB-compatible portable solar charger. 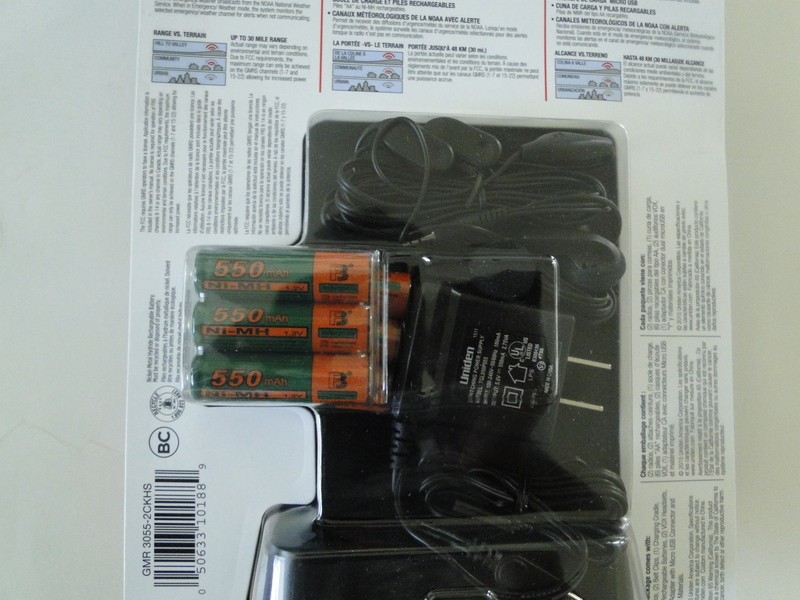 If your power is running low and you don’t have any means of charging the radio, simply switch the rechargeable NiMH batteries for disposable AA ones.